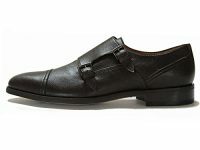 It's much easier to shop for men's vegan dress shoes if you know that what you're looking at is actually vegan. Every pair of dress shoes listed below is completely free of leather, suede, animal by-product based adhesives, and any animal-derived materials whatsoever. 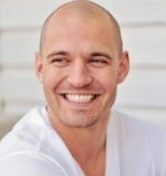 What are “vegan” men’s dress shoes? 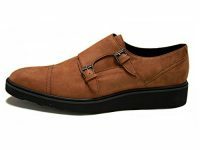 Vegan men’s dress shoes are shoes with a formal, elegant, and dressy appeal that only use materials (including dyes and adhesives) that are not derived from, or tested on animals, and are thusly considered ‘cruelty-free’. They can come in a variety of colours and styles, and can be made from different natural and synthetic materials. What materials are used to make vegan men’s dress shoes? What dress shoes styles are there? Why buy dress shoes that are vegan? Why harm something that you don’t have to? 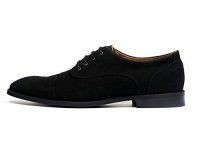 All styles and colours of dress shoes can be made with non-leather and suede, cruelty-free materials. They can pull off the same, look, feel and function as their leather and suede based counterparts. Does buying one pair of vegan dress shoes really make a difference? Yes, and it’s actually a very effective form of animal activism! Here’s how it works: When you buy a pair of cruelty-free and vegan dress shoes, you’re telling the store that if they stock these items, they will sell. That in turn, tells manufacturers to keep supplying these shoes to stores. All of a sudden, companies are focusing on keeping vegan options in their supply chain, which gives people the option to forego leather and suede dress shoes. This is a virtuous circle; revenue coming in from these products will be re-invested into vegan-friendly brands and product lines, and not put into cruelty-derived ones…ultimately resulting in more demand and supply for these vegan-friendly products, and less supply and demand for shoes made of animal skins. Are men’s vegan dress shoes expensive? Similar to their non-vegan counterparts, the cost to make vegan dress shoes can vary quite a bit from one company and one pair to the next, due to differences in materials used and production methods employed. As a result, their retail prices will vary quite a bit; some are quite affordable, whereas others would be considered luxury items, and many fall somewhere in between. Should I get rid of non-vegan dress shoes that I already own? This is a controversial topic within the vegan community. In our opinion, it’s up to you to decide when and how to start turning your wardrobe over. If you can’t even look at your leather oxfords after you turn vegan, then give them away or sell them. Alternatively, if you want to keep wearing them until they've outlived their usefulness due to the expense or inconvenience of replacing them, simply replace them with a vegan pair of oxfords when the time is right. Whatever you do, try to avoid simply throwing them away. Whatever choice you make, it’s ultimately yours. What companies make vegan dress shoes for men? We keep a list of shoe companies that we find by way of social media, word of mouth, by old-fashioned Google searches and by other methods, whose entire catalogue, or a specific model, of men’s dress shoes seems to be vegan and cruelty-free, and thus animal-friendly. We contact these companies to check that they don’t use any animal-derived materials or testing in the making of these products. If we’re convinced the items are suitable for vegans, and they’re listed on Amazon, then we display them here for your shopping convenience! 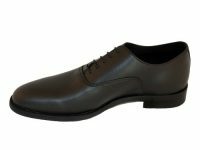 Do you list vegan dress shoes from non-vegan companies? We think it’s great that more and more non-vegan companies are adding cruelty-free dress shoes and other items to their catalogue, whatever the reasoning behind it might be. If we contact these companies to check on the “veganism” of their shoes and we can’t get complete, consistent and straight answers to our questions, we won’t list their products. However, if multiple company representatives assure us that certain (or all) products are vegan and cruelty-free, and they provide us with clear and consistent answers, and they’re listed on Amazon, then we’ll list them. If you or your employer makes vegan oxfords, derbies, loafers, monk straps, dress boots, wingtips, formal pumps or cap toes, or any vegan product for that matter, we’d love to feature those products on our site... for free! Contact us at - info(at)getitvegan(dot)com - to find out more!